Have you run out of storage space in your home? While most homes have run out of space, we also have a lot more ‘stuff’ to store. And there are certainly better ways we could be storing our things to really maximise the space. And one of my most use tricks to creating space where you just didn’t think there was any – is by using hooks. Are you using your door and wall space? There is a lot of unused space on our doors and walls and by simply installing a hook system, we can utilise vertical space. You might be thinking that you can’t or don’t want to drill holes (although this is advisable for holding heavy loads) – hooks don’t always need to be permanently fixed into place. Other options include over the door hooks or suction material hooks. These solutions are perfect for those renting their homes or who just want to try a temporary system first. They are also reusable which makes them super versatile for any areas around your home. Where to use hooks in your home. Hooks in your kitchen cupboards are great for storing tea towels and hooks on your walls can store commonly used utensils, making them easily accessible. Hooks in your bathroom can store towels to dry when not in use. In bedrooms they can store dressing gowns or winter jackets and coats that are worn every day. And entry ways can store school bags once the kids come home from school or keys so they don’t keep getting lost. By creating an allocated space with hooks for items that are used regularly, it will also keep them from being left around making the house look messy. Plus they can easily be reached as required. This is definitely a simple job for you to tackle this weekend. For helpful tips, advice, humour and inspiration on getting organised, subscribe to my newsletter or follow me on social media – click on the links below. When you need that favourite piece of clothing that’s perfect for your event, it always seems to be lost to the back of the wardrobe amongst clothes that aren’t even in season. 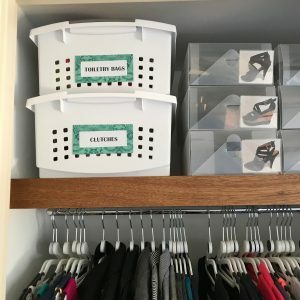 Storing absolutely everything we own, regardless of the whether we are wearing it, is a typical example of why our wardrobes are bursting at the seam – plus the fact that most of us have too many clothes! Winter clothes taking up majority of the space in your wardrobe when its summer, just doesn’t make sense. Not only does this make it hard to store everything but your clothing can become damaged when it’s just shoved in to try to make it fit. Or worse, in piles on the floor. And while this will probably not stop us from buying in excess (we all love a sale!) storing our out of season clothing elsewhere, means we can really see the clothing that is wearable right now. Space Bags Are A Space Saver! My favourite product to use when storing out of season clothing, is space bags. Not only can they triple your storage space but they are airtight, waterproof, re-usable and will protect your clothes against dirt, mildew and odours. If you have a large family and could easily store a number of space bags away for the season, then its worth also storing them in tubs. Vacuum the air out of the space bags once they are in the tubs ensuring that you push the bags into the corners of the tubs, using up every bit of space – repeat this till the tub is full. It is extremely difficult to store space bags in tubs after the air has been taken out as the bags stiffen up. Once done, your tubs can be stacked away neatly. Make sure you label the contents so if you need something, you know where to find it. I also like to store my shoes in seasonal categories. All my summer sandals and strappy high heeled shoes fit nicely in a tub under the bed. They are easy to access when needed but aren’t in the way of my everyday shoes, especially in winter when I mainly wear enclosed shoes. A lot of our hard earned money is spent on clothing and shoes, so storing them right so they last longer, is definitely a money saver. You know the daily tasks that need to be done every day. Your kids know the daily tasks that they need to be doing every day. However, when life gets hectic and distractions happen (as they always do) everyone seems to forget what needs to be done. So in the end, nothing gets done! There is just so much going on in our heads these days that we struggle to focus on the tasks at hand and can forget even the simplest of things. When we finally get going, our progress is soon cut short with constant distractions and interruptions. Create lists for recurring tasks. Kid’s chores are a perfect example of tasks that need to be done constantly. Though no matter how many times they are told, they still seem to get missed. If you are distracted elsewhere then you know that nothing will be getting done. All you end up with is yelling and screaming and raised stress levels! For tasks that are done on a regular basis, write up the list and laminate it. This way you can check off once done and wipe clean for a new day or week. Weekly or monthly cleaning schedules help you check off what needs to be done so nothing gets missed. Even though party planning can be different each time, having a basic checklist for the things that need to be done will definitely save you time and money. Your daily to do list should be written the night before so you know how your day is going to run – and what time to set your alarm clock. Creating this list also helps get the ideas out of your head and you can see potential problems or time wasters before they start. Like tasks that can be done at the same time or errands in the same locations. Writing a list of the meals you want to make for the week is a massive time and money saver. It helps keep your stress levels down when you know what meals your family will be eating. 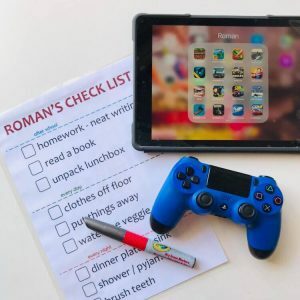 Plus it makes it super simple to shop for these items and prep or plan around those crazy bust weeknights when activities or events can make life chaotic. A word of warning though… Try not to write down more than five things on the list or you run the risk of being overwhelmed and just avoiding it altogether. If this sounds like you then aim for three tasks only, prioritise them in order of importance, then start at number one. Creating lists will help keep your families schedules running on time creating a happier healthier household. Do you find yourself running all over the house, in and out of each room a number of times while trying to clean your home? Do you feel like you’re getting nowhere… your quick clean has now turned into a whole morning and you still haven’t finished? Then a caddy that keeps all your cloths, wipes, bin bags, cleaning products etc together is just what you need. There is alot of time wasted going backwards and forwards throughout your home. By keeping your items together you can clean in a systemised way which will get the job done alot quicker. Yay! How to effectively use your caddy. Everything you use should be in your caddy. Mirco fibre cloths, scrubbers, gloves, sprays, detergents, disinfectants, wipes, bin bags for collecting rubbish and emptying bins, squeegee for glass surfaces and whatever else you use. After you have put away all the clutter in your home, it’s time to get started. Carry your caddy firstly throughout your bathrooms and toilets, which require spraying, then leave them to sit while you get onto the next job. Then take your caddy into the first room to tidy up, dust and wipe down the surfaces. Then continue onto the next room and repeat. Once they are done you can head back to the bathrooms and toilets to give them a scrub and squeegee with all your cleaning products still at arm’s length. Lastly, you’re only left to vacuum the house and mop the floors. Setting up an easy cleaning routine like this one and having a cleaning caddy to carry your products around is such a simple way to save you time. You’ve had a chaotic day, the kids are at each other’s throats and you’re looking forward to nothing more than putting you feet up when you walk through the door… but then you realise you need to get started on dinner!?! Stress levels rise as you contemplate take out for the second time this week. While nothing can prepare you for those really crappy days, a prepared meal from the freezer certainly helps. Less time spent in the kitchen prepping a meal and less dishes to clean up afterwards means more time relaxing with your family. I cannot get all the things done in my week if I didn’t take advantage of my freezer. I always have some sort of pre-prepared snack or meal in my freezer which saves me so much time in my week for other important things. Buying foods in bulk or when they’re on special is also a money saver. But making sure you don’t waste this saved money is just as important. Any excess food gets labelled and stored in the freezer to be used another time, like stocks or sauces. Plus by making a bulk batch of snacks for the freezer means I can just put them in the oven (from frozen) to be cooked fresh when needed. Perfect items for the freezer. Pre made dinners like lasagne, soups or curries – this way you can just reheat and eat. Part made dinners like slow cooked meats or pasta sauce – means minimal prep time just making the sides. Snacks like scrolls, homemade sausage rolls or muffins – means lunchboxes are always packed or hungry kids can be fed straight after school. Leftovers are perfect for lunches or single meals. Excess food like sauces, cheese, stock, bread, dough – don’t let them go to waste. Fruits & Veg – all fruits make great smoothies and veggies like beans, corn, spinach, kale etc can be added to stews or soups as required. If you have a couple hours free this weekend then why not try making a couple meals up in advance for those rushed week night dinners. The effort is well worth it. 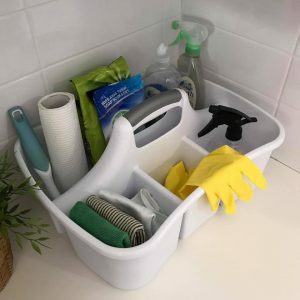 Baskets and trays are one of the most cost effective ways to organise your home. Their sole purpose is to keep like items together and they do this brilliantly. I always find that items that aren’t contained within a basket or tray, generally end up encroaching on the space of other items. Its great for defining spaces as it creates boundaries. I have baskets and trays all over my house. 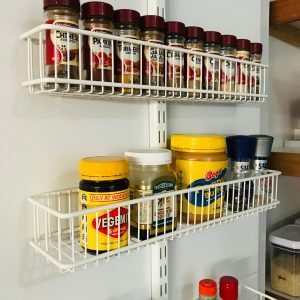 They range in various sizes and I feel they are one of the main reasons that my house stays so organised. They keep things in place that would otherwise turn into a cluttered mess. And of course I like to add nice labels to complete the look. The stackable ones are my favourite since they really do maximise space, especially on shelves where there is a lot of vertical space wasted. Some are nice and sturdy and if they are deep enough, can almost turn a shelf into a drawer system which always maximises space. 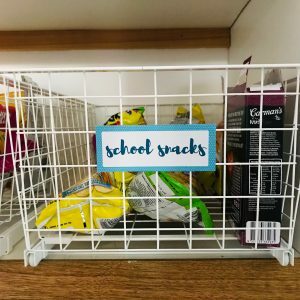 These Elfa Easy Glider baskets are my favourite product to use in pantries and kitchen cupboards, especially the lower shelves which require bending to see what is stored there. Trays are perfect for drawers or items that require a more shallow depth. Cutlery and utensil drawers are a great example. And then there are the cheaper options of just the plain plastic, nothing fancy baskets and trays which are still just as suitable. Plus if they are no longer suit the current space then they can be used elsewhere. So it really depends on your budget but baskets and trays are definitely something worth investing in. Do you try super hard to be organised by writing lists of things that need to be done? Do you get frustrated when important notes or lists that are written on paper, mysteriously disappear amongst the paperwork throughout your home? Or you can never find a pen or paper when you need to jot down those important things? This is where whiteboards really do come in handy. And no, they aren’t just restricted to office spaces. Use them where you need them. Kitchen – keeping this on your pantry door comes in handy for jotting down shopping lists and grocery items as you use them. Family Command Centre – these are a must in any family command centre or drop zone. This is an area where you can leave keys, devices to be charged, incoming mail, school permission slips that need to be completed etc. With the addition of a whiteboard, you can draw a weekly calendar with permanent marker and then important dates or kids activities can be marked in – then everything erased (except the calendar outline) to start again the following week. Kids Rooms – great for younger kids to be to draw on and helpful for the older kids to keep track of schedules and things that are important. Office – and of course the home office where you can keep track of bills to be paid and tasks that need to be completed. Multi function whiteboards have it all. Some have storage pockets, elastic straps, magnets and magnetic clips for hanging all your important memos. No more pegboards with sharp pins or dusty blackboards. They are great for keeping together your bills, photos, kids artwork, social invitations and more. And being able to jot down notes, ideas, lists or anything that come to mind easily is such a time saver. But by far the best use is that we can write then re-write over and over again. Have you ever come home from a trip to the grocery store to find that you have purchased vegetable stock again and you now have 15 litres of it? Or you thought you had coconut milk in your pantry… but you don’t. Nobody likes to waste their time or money! The never ending mess in pantries. Pantries are one of my most requested areas in the home to get organised. We are continually buying, using and moving the stock in our pantries so I’m not surprised that it gets messy so quickly. Plus the very impractical shelf depth of 45cm can make it impossible to see all the products you have in there. And don’t mention the mess that is made when you try and reach for anything at the very back. My go to product is the Madesmart expandable tiered shelf organiser. 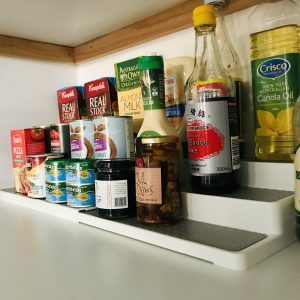 This shelf organiser expands up to 66cm to fit your own pantry needs plus it’s made with durable plastic and the tiers are lined with a soft grip material to keep your items in place. And at $35.95, it is well worth the investment. We all have tinned food, bottled sauces, stock, oil and lots of types of jars that keep for a long time. Having a way to organise these well will ensure your pantry stays neat and tidy. If you find numerous quantities of the same type of food in your pantry then think of the money you will save grocery shopping in the future. With such a simple way to organise your pantry items, why not spend a little time this weekend getting it done. You will be glad you did. Do you find that in moments of calm, you totally know what needs to be done and feel like you have it all under control? But all it takes is a little bit of stress and chaos and your whole thought process totally goes out the window… think of your mornings before a busy day. You and your family know what needs to be done but in the rush of it all, something always gets forgotten.. This is where checklists help. For those tasks that are done on a regular basis, it still doesn’t hurt to make a checklist. Kids chores are a perfect example.. and I like to add in the basics as well, such as brushing their teeth – since no matter how many times they are told, they still forget! By laminating these checklists, a dry erase marker can be used to check them off once completed and then wiped clean to start a new day or week. • Party and Event planning would be a lot more stressful if you didn’t keep a checklist on the things that need to be ordered or purchased. Not to mention keeping track of invites and RSVP’s. • Cleaning is made a lot simpler by using a checklist of your weekly or monthly routine. • Kids Chores that need to be done daily or weekly. By enforcing the rule that these items must be done before screen time or play time will hopefully get them done quicker. • Travel Checklists are handy to avoid forgetting those important items.. like your passport. • Any project at work or home that requires numerous tasks to be achieved. Checklists are such a time saver when you are rushed and don’t feel like you even have the time to think about what needs to be done next. Plus they help keep you focused on the important tasks and it is incredibly satisfying when, at the end of the day, everything is checked off. Do you feel like you have run out of storage space at home? Do you feel like your cupboards are at their maximum limit and not another thing can fit in without them bursting? With your cupboards being this full, can you actually find anything that is stored inside? Did you know that the space on your doors is one of the best places to store your everyday items? My go to product is the Elfa Over The Door Rack system which is perfect for internal doors. Even better, it hooks over the door so you don’t actually need to attach it permanently in place – although you can if you want to. It’s perfect for those renting their home as well. This system is so easy to install and with the various sized baskets being adjustable, it can be tailored to suit all of your needs. A lot of internal doors have a frame that has a gap of about 10cm so the baskets fit well within this space. For the large basket which requires space of 13.5cm, it just needs to be sitting above the shelf so the door can close. When I install these systems into my client’s homes, I always make sure their everyday items are place in these baskets. It is incredibly convenient to just open the door and everything you need being in plain sight for you to access and put away easily. Other products that use vertical space without having to attach fixtures permanently are suction storage products or over the door hooks. If you like something a little stronger and don’t mind a bit of diy.. why not install a shelf or hook system? The options are endless and these products will help keep your home neat, tidy and well organised.